GoPro’s CEO Nick Woodman announced Thursday that his company was developing a spherical mount that can house six action cameras at once for making virtual reality videos. He also said that GoPro will make its own quadcopter. 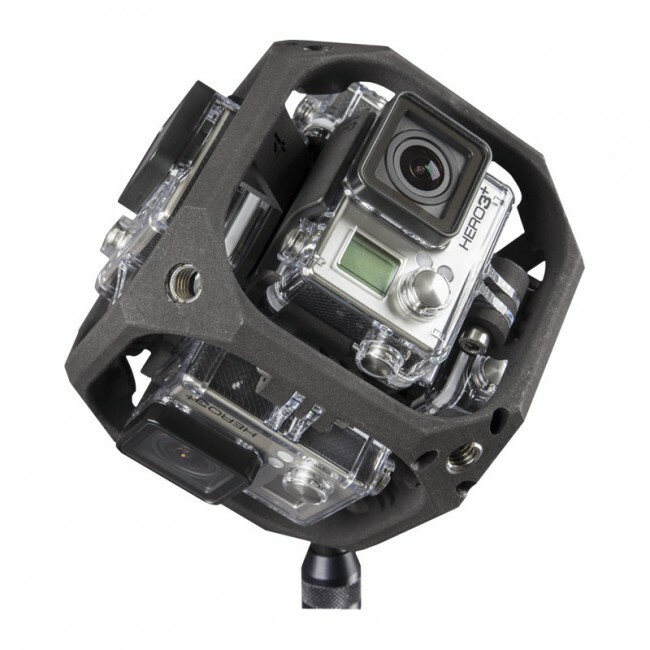 Woodman said that the GoPro drone will come out in early 2016, along with assorted related products. The six-camera mount, a prototype of which was displayed at the conference, will be available in the second half of 2015. A prototype of the 6-camera spherical mount (GoPro). GoPro’s entry into the virtual reality market was not unexpected. Last month, it acquired the French company Kolor, which creates software that combines separate video recordings to create a panoramic, immersive product. Earlier, Kolor and Intel collaborated to film an interactive, 360 degree music video, the first of its kind on YouTube, where the user can change his perspective by dragging the video left or right. GoPro’s release of the virtual reality camera mount is well timed, as Oculus VR will release its first commercial headset in the first quarter of 2016. Virtual reality has enjoyed a renaissance in the past few years, and the market is now teeming with an array of headsets from established companies like Microsoft, Google, and Samsung. Always wanted to live stream your epic base jumping GoPro videos instead of shooting the footage and uploading it later?